It’s amazing how many people out there still don’t believe that the gender wage gap actually means anything or that it isn’t “as bad” as some women make it out to be. Alas, it’s very, very real, which is why we thought you might need some statistics about the gender pay gap to put in your pocket. These are great to pull out the next time you hear someone say something sideways and incorrect about what it means to be a woman in today’s working world. That’s not to say that the gender wage gap isn’t complicated to understand. To really get to the bottom of it and start closing it, we, as a society, have to grapple with some pretty ugly truths about how we tend to force women into traditional gender roles like mother and housekeeper, and particularly how we value women based on their race. For example, white women make less than white men and Asian Americans of both genders, but make more than Black women, which still surprises some people. Black women earn a little more on the dollar than Native American women, and Hispanic women make the very least. Black, Hispanic, and Native American men are also making less than both white men and women, overall, according to the Pew Research Center. To understand the gender wage gap, we also have to deal with racial discrimination, which is maybe one reason so many people pretend that it just doesn’t happen. Here are some stats that make can put the gender wage gap in perspective. The gender wage gap isn’t just an American thing — it’s an everyone thing. Women earn less than their male counterparts all over the world, even in countries that make things as gender neutral as possible when it comes to policy, such as Iceland, where women make anywhere from 14 to 20 percent less than male peers. 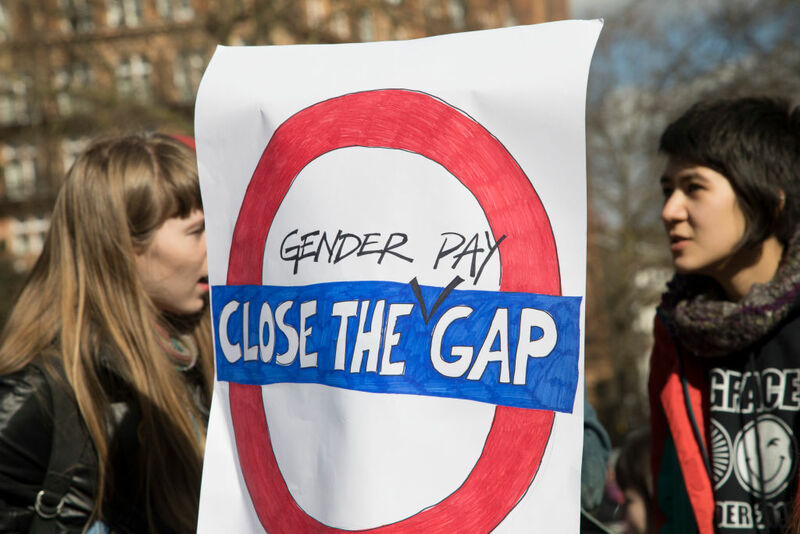 This despite new legislation that was enacted with the sole purpose of closing the gender pay gap, according to the World Economic Forum, which analyzed 144 countries in both 2006 and 2017. While some of those countries have made progress in closing their gap, others have actually increased their gender wage gap. 2It will take hundreds of years to close the gap. With some countries increasing their gender wage gap, and taking other economic factors into consideration, it might take 217 years to close the gender wage gap on a global scale, according to the WEF. Some countries may do it sooner than that, such as Iceland, which is determined to close their wage gap by 2022. But over 200 years for the rest of the world is way too long. It’s also longer than previously estimated when the WEF first started compiling the report, which means that entire generations of girls are missing out on equal pay. 3Women of color lose more than anyone else. According to data from the Center of American Progress, over the course of 40 years, women lose about $430,480 throughout their careers. But Latinas lose a total of $1,007,080 and African American women lose $877,480 over the same course of time. These kinds of losses make it harder to save for retirement, and on average, women have half the retirement savings than men. 4Men make more even in “pink collar” jobs. 5It doesn’t matter what degree you have. "At every level of academic achievement, women’s median earnings are less than men’s median earnings, and in some cases, the gender pay gap is larger at higher levels of education. Education improves earnings for women of all races and ethnicities, but earnings are affected by race and ethnicity as well as gender. White women are paid more than black and Hispanic women at all education levels." For the first time in history, women are more educated than men, and still earn less, which makes no sense. 6It’s not just about having kids. Women do tend to leave the workforce after having kids, which often sets them back in their careers. But not all women do, and even those who remain in the labor force make less than their male counterparts. Only women’s wages go down after having kids, though. Men’s tend to stay the same, which is just further proof that we need better parental leave and work/life balance policies. We shouldn’t just assume that because women usually carry babies that they should be punished financially for the rest of their lives. It takes two to make a baby, right? 7Sexual harassment plays a big role. Sexual harassment isn’t just awful and illegal, it also affects the gender pay gap, according to a 2017 report. The study found that women who reported being sexually harassed were more likely to switch jobs, often to one with lower pay and less chance of moving up the ranks. Or at the very least, they start from scratch, having to prove their worth in order to get a promotion or a raise. The researchers wrote that women were tossed “off-course during the formative early years of their career” because of sexual harassment at the office. Toxic masculinity is at the root of so many of our problems. The gender pay gap is very real, no matter what anyone says. It will take time to fix, but with awareness and policies that protect and empower all kinds of women in the workforce, it will happen.